The environment is clearly a demanding one; transportation difficulties limit people's mobility and their ability to trade, and there is some mention of extreme weather conditions such as drought and hail, which at times have destroyed people's crops and fruit trees. One narrator (Junrong, China 39) feels particularly negative, "Maybe I am shortsighted. The natural conditions here are so poor that I do not think there is much we can do. We do not have any factories. It is a rocky mountain with a thin layer of soil and there's often a drought. It is very difficult to plant fruit trees. We have to depend on the weather." However, later she acknowledges there have been some improvements to the environment: "Generally speaking, the mountains are greener than before. People used to cut all the trees on the hill for fuel. Now there is better conservation of water and soil." 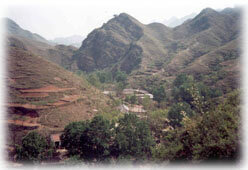 Several narrators have taken leases on sections of the mountain slopes in order to plant trees, mainly fruit varieties. The village head (China 30) met a man in another area who was generating much profit from the trees he had planted on similarly barren land and she was inspired to do the same in Huanglongsi. In order to be able to plant anything on these slopes, villagers have to clear them of many stones and rocks and bring in water supplies. Lack of water for cultivation is a problem mentioned by several women. Cultivating the mountainside is back-breaking work, but the women believe that only through such investment in the surrounding environment can they get rid of poverty in the long term. Even though these afforestation projects are long-term, some benefits are already visible. Several mention the increased tree cover. People collecting "dead wood" for fuel from the hillside must pay the person who has taken on the lease for that area. Collecting and cutting fuel wood seems to have been a male responsibility, but is now undertaken by many women as their husbands are working in the cities. Twigs from chaste trees are collected for fuel and in times of financial hardship are sometimes sold at market. The flexibility of chaste wood means the branches are also used for basket-making. As well as the physical hardships of their mountain environment ("we have to climb up and down the hills all the time"), some women (China 38) mention a psychological effect: "Being confined in the mountains makes me feel so restrained. How nice it would be if I could have a chance to go out to have a look at the outside world." Despite the rigours of the environment women also acknowledge its benefits: fresh air, clean water and a reasonable degree of self-sufficiency in terms of food and fuel wood. "The environment of the mountain area is good. The water is fresh and the air is fresh, too. We don't need to pay for using water. We can cut grass on the hill at any time to raise sheep, pigs and rabbits…We are self-sufficient and self-contained. But we don't have many transport facilities. We have trouble when we want to sell persimmons. However, it's much better than before. There is a road which is open to traffic." "[Climbing] up and down the hills all the time…is really very tiring. That also makes it hard to transport goods if you want to do business. Even going to see a doctor is difficult." "I don't want to live in Mancheng. The air is not clean. I can't bear that. I am happy to live in my village. I don't want to live in Beijing as the air is not clean either…I like mountains. I don't want to go anywhere else." "The changes [in the mountain] are also very great. There are fruit trees on the mountain [now]. But when I came to the village, there were only elms on the mountain…However, there was a plague of insects then the elms all died… When I was in my 20s, there were nothing on the mountain - there were few trees…"
"Seeing us working on the hills everyday, our neighbours said, "The couple must be out of their minds, how can trees grow on such rocky hills?" They still thought I was doing something wrong. Last year all the 100 plum trees we planted blossomed. It looked like white clouds on the hills. Not until then did the villagers begin to realise that we are doing promising work. Now they look at us with envious eyes." "I wanted to leave the place before, but I never had any opportunity. This is my birthplace and I grew up here. I can't bear to part with the place. I just want to change its appearance!"